Whether you are renting out a property for the first time or you are in-between tenants, making the right improvements will help with renting the property quickly and fetching a higher rental rate. In regard to the bathroom, there are many upgrades available, and one of them is deciding whether you want to have a shower curtain or shower door, which can change the look and function significantly. With a rental property, you will benefit most with shower doors for several reasons. It is possible for a shower rod and curtain to look nice, but presenting this to a potential tenant is not going to be as impressive as showing off a brand new glass shower door. Creating a modern appearance in excellent for catering to those wanting a new look, and it will help you succeed in charging more for rent to the individuals that are interested in this particular style. If a tenant has children or is simply not used to showering with a curtain, it is highly likely that each shower will create water puddles on the bathroom floor. Although this is okay when it is cleaned up afterwards, prolonged and repeated exposure can lead to rotted flooring, which is a major and expensive problem. Maintaining a shower curtain is difficult because there is no easy way to keep it clean. It collects dirt and grime over time, and eventually it needs to be replaced. However, cleaning a shower door is as simple as using a squeegee after every shower, and then doing a deep clean every few months. If you want an easy-to-maintain and good-looking bathroom, a solid upgrade is a shower door. 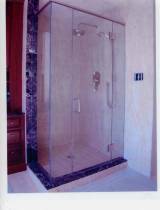 Contact us to learn about your options for getting a shower door in your rental home. When it comes to turning your ensuite bath into your ideal bathroom, an excellent area to focus on is the shower, especially when you use it on a regular basis. Using a shower is the fastest and most effective way to get fresh and clean in the morning, so it makes sense to make this experience as positive as possible. Accomplishing this goal becomes easy when you incorporate glass shower doors, and this is because they provide many advantages compared to other shower enclosing options. Getting a glass shower door is an excellent way to minimize the maintenance and repairs that must be done inside of your bathroom. Since most homeowners tend to forego preventative maintenance and end up procrastinating on necessary repairs, not needing much in either category generally means an ideal experience for homeowners. It is even better when you get your hands on a frameless shower door, and this is because there is even less metal to clean on a regular basis. While you still need to clean a glass shower door, the process of doing it the right way is very easy. All you need to do is administer an application of transparent polymer coating to the door. Doing this will prevent mold from arising, and it will also reduce the amount of mildew that forms. Following these steps regularly will maximize the lifespan of your glass shower door, which can last an extremely long time. Although there are very strong metals that are used in bathrooms, one problem that they present is the fact that they can develop rust. However, a glass shower door, especially a frameless shower door will ensure this does not become a problem in the future. Investing into this kind of shower door means being able to retain the value of your bathrooms as you will not have to deal with as much corrosive materials. If you want to make this beneficial addition to your home, contact us for additional information.